Full Canopy Tester bed constructed of tiger mahogany, has four “Cloverleaf or Apostle” style posts on a single canopy bed. This room Includes a fireplace and walk-in shower. This room is reserved exclusively for guests over 18 years of age. 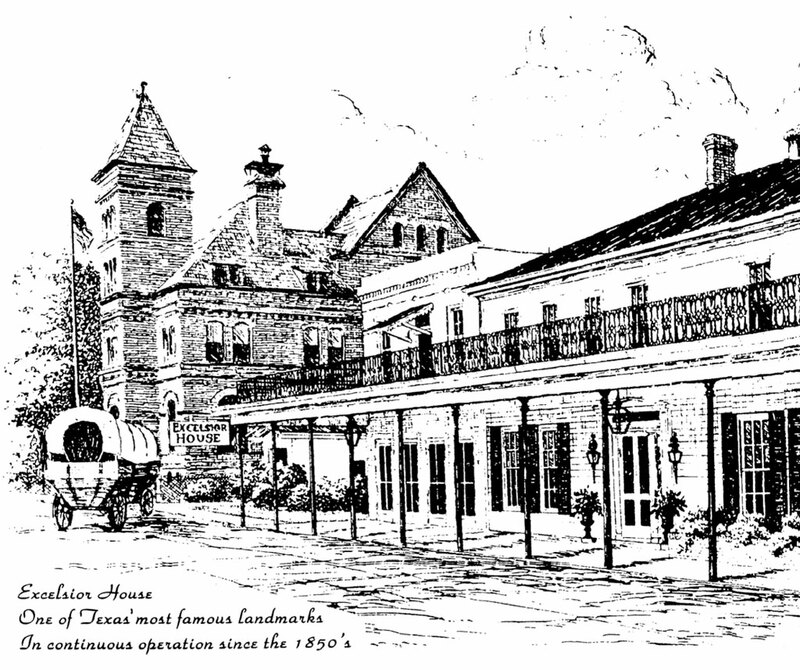 Welcome to The Excelsior House Hotel in Jefferson, Texas! The Excelsior House welcomes you as it has welcomed travelers since the late 1850’s. Famous people registered at the Excelsior House include Ulysses S. Grant, Oscar Wilde, Rutherford B. Hayes and Lady Bird Johnson to name a few. Southern charm graces this historic hotel with rich rosewood, cherry, and mahogany furnishings, constructed of brick and timber, with lacy iron work gallery. The Excelsior House has become an antique lover’s delight. Try something different and live your life to the fullest by experiencing a vacation, wedding or honeymoon at our hotel. You will experience superb southern hospitality in downtown Historic Jefferson, Texas. Today, with the beautifully appointed ballroom and dining room and the manicured grounds, the hotel excels in southern elegance and taste, including the World Famous Orange Blossom Muffins served on the weekends at breakfast. Historic Elegance, Intrigue and More! Follow Bob Mauldin (Television series Expedition Texas) in his four part series as he visits Jefferson. Here in part 2 he interviews Laura Miller about the Excelsior Hotel.